Janelle Scotland, Chair of the Association of Scottish Talking Newspapers and Lothiansound, calls for help in attracting new listeners. There are 65 talking newspapers in Scotland. The Association of Scottish Talking Newspapers (ASTN) offers support and guidance to them and to any new groups thinking of starting up. It organises training days, often specifically tailored to meet the needs of one group, and an annual conference attended by delegates from talking newspapers all over Scotland and associated organisations. Despite the financial climate, funding for running or setting up talking newspapers does not seem to be difficult to find. Perhaps this is because many of them exist in rural parts of the country where local businesses and clubs are most likely to help. Raising awareness of talking newspapers seems to be the greatest difficulty. 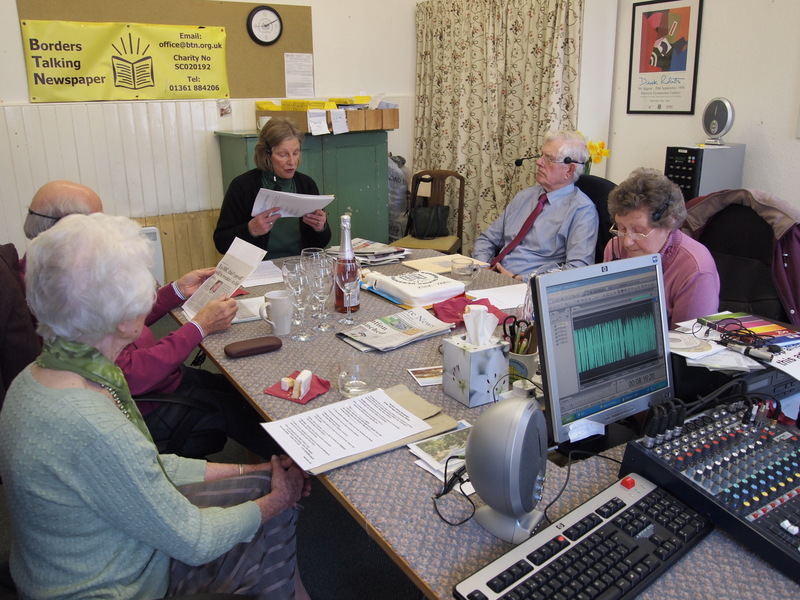 Our potential listeners can’t read the notices in the library or optician’s waiting room so we have to rely on people like you to help us spread the news to others who may benefit from our service. ASTN encourages all talking newspapers to have a website. This often attracts the attention of family and friends of blind and partially sighted people. Last year, Lothiansound, an Edinburgh based talking newspaper, celebrated 25 years of delivering a weekly recording to hundreds of lsteners, mostly in the Lothians but as far afield as Malta. Their local MSP, Jim Eadie, secured a debate in the Scottish Parliament followed by a reception in honour of Lothiansound. Jim and three other MSPs, extolled the virtues of the talking newspaper service in Scotland and congratulated Lothiansound. If more MSPs would take an interest in their local talking newspaper, the ensuing publicity would help our cause. Apart from a weekly CD of local news, Lothiansound has recently started to record a monthly CD of articles from the Scots Magazine. Copies of this can be request from Lothiansound on 0131 6612850 or by email to info@lothiansound.org.uk. Email ASTN for information about talking newspapers in Scotland, whether a potential listener/recipient, or with a view to setting up, or volunteering for, a talking newspaper. Today was the official launch of Silver Line Scotland. 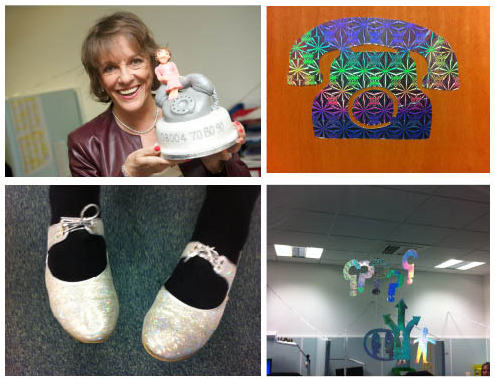 The team had decorated the Helpline with silvery decorations and made Esther Rantzen a cake to commemorate the launch. We also dressed for the occasion in a variety of silver clothing, shoes and accessories. We had a busy start to the morning with calls in the first few minutes of opening. The Silver Line is open 24 hours on 0800 4 70 80 90, but Silver Line (UK) manage the calls overnight from their centre in Blackpool, then Silver Line Scotland take the Scottish calls from 8am to 8pm on weekdays. ‘No question too big, no problem too small, no need to be alone’. Age Scotland Helpline has been a trusted source of information for many years and calls have always been quite varied and unpredictable. We receive calls on subjects as diverse as care, housing, heating, benefits and everything else besides (‘How do I get my letter from the Queen when I turn 100?’, ‘I’m struggling to hear my phone ringing, what can I do?’) but with the addition of Silver Line we have an extra dimension to our service. Many of our calls this week have been from people wanting to chat, wanting to sign up to be a Silver Line volunteer, to have a Silver Line friend or just wanting to pass on their thoughts about the service. We’ve had some great feedback on how excited people are that the friend service is available and how pleased they are that they can ring 24 hours to speak to someone. We have still received our usual mix of calls about care, housing, benefits and older people’s rights, but we’ve also had people feeling lonely or isolated, or just wanting to get something off their chest. It’s been a busy week for the Helpline and we’re looking forward to it carrying on as Silver Line becomes more well-known and grows from strength to strength. 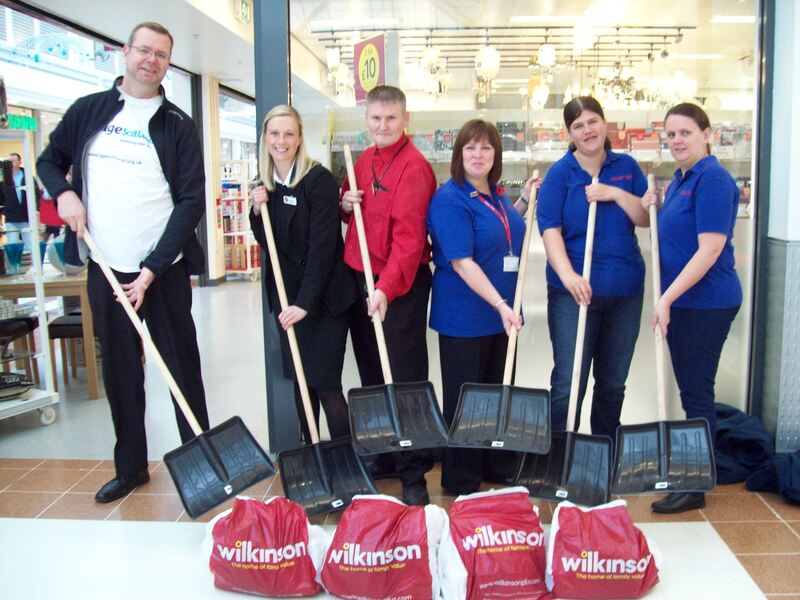 A kind donation of 100 snow shovels from the Wilkinson store in Livingston was gratefully received by staff and volunteers at the Food Train West Lothian last week. 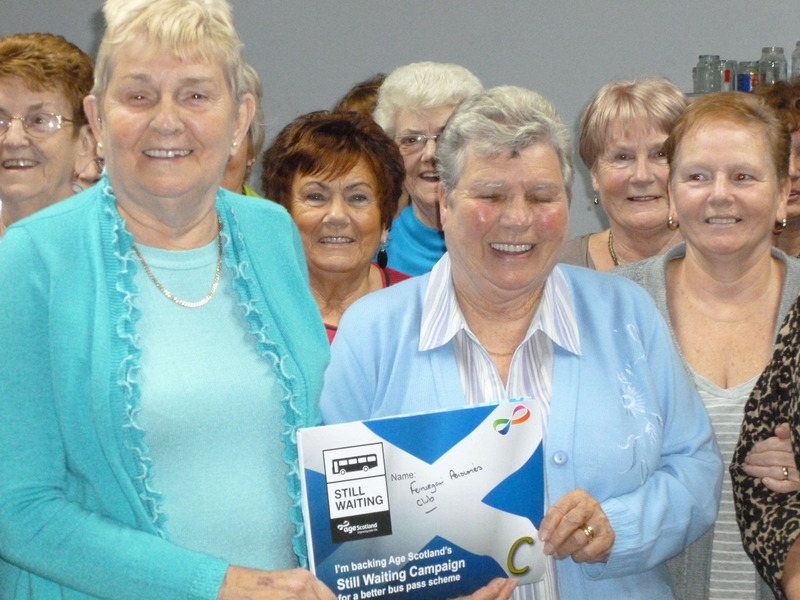 Wilkinson Livingston initially contacted Age Scotland’s fundraising department to make the generous offer, which they wanted to donate to benefit older people in the Livingston area of West Lothian. Alison Payne, one of Age Scotland’s fundraising officers, made immediate contact with local Development Officer, Laura Dunkel, to get some help with finding a member group who could make use of the shovels. Martin (Age Scotland), Lorraine Thomson (Manager, Wilkinson Livingston Store), David Stewart (Wilkinson Livingston Store), Linda Lockie (Regional Manager, The Food Train) and the two volunteers from the Food Train. The Food Train always welcome any new enquiries from people interested in donating their time to assist in their local community, by becoming volunteer drivers, helpers, shoppers and Extra Service volunteers. If you would like to volunteer or know of an older people who might benefit from the Food Train’s service, more information can be found by calling 01506 413013 or visiting www.thefoodtrain.co.uk. 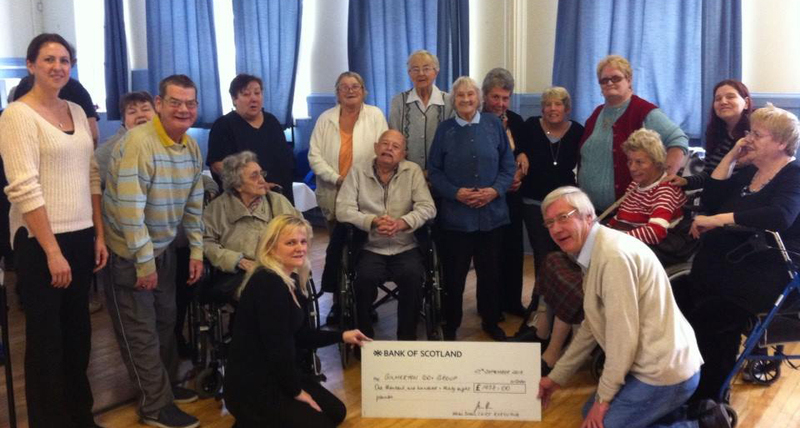 Age Scotland Development Officer, Laura Dunkel, recently visited Gilmerton 60+ group to award them with a cheque for an Age Scotland grant of £1938.00. The money will be used to buy equipment, such as board games, laptop, projector and an audio system, which will enhance the activities on offer for group members. This grant will also be used to pay for the food and drink at the group’s Christmas party at the local Waverley Inn. The Gilmerton 60+ group runs on a Monday, Tuesday and Friday and consist of over 30 members who are collected from their home and brought to the group at Gilmerton Community Centre. At the group they have lunch in the company of others and enjoy a range of activities and games, such as bingo, dominoes, bowls, gentle exercise and arts and crafts. If you have a few hours to spare and could volunteer with the Gilmerton 60+ group, please contact the group through Gilmerton Community Centre on 0131 664 2335. For information or advice about any aspect of the ageing journey, call the Age Scotland Helpline on 0845 125 9732. Help us continue to provide grants to help end isolation for older people by donating to Age Scotland. Last winter Margaret, who lives in Dumfries, became one of our case studies for our Still Waiting campaign for a better bus pass and to help end isolation for older people. . Although living close to a main road with regular buses, she was unable to make use of them as she can hardly walk and, with severe osteoarthritis, can’t use a wheelchair. After we published the case study Dumfries and Galloway Council got in touch with us. They felt Margaret’s story painted local bus services in too poor a light. So Morag Halliday, our local Development Officer, took Margaret to meet them and, following this, the local Stagecoach manager visited her and found a solution to getting her mobility scooter on the bus. As you can see from the video – this is not easy, so we also arranged for a befriending scheme to provide a volunteer buddy for some journeys; previously she had had to spend a lot of money to have a professional care worker accompany her. We are really pleased that Margaret’s story shows how we’re linking national campaigns to action in communities to improve the lives of older people. Take action now and sign the Still Waiting petition for a better bus pass.